Sold by bag (see below). 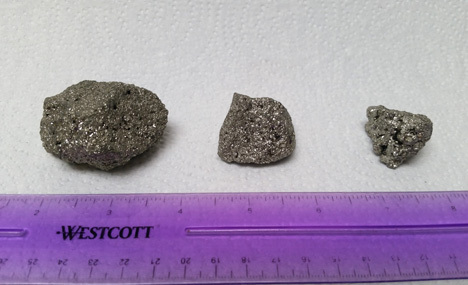 Chispa Grade Iron Pyrite Nuggets from Peru. 50 pieces at $0.35 size, approx. 0.75"-1"
50 pieces at $0.75 size, approx. 1"-1.5"
25 pieces at $1.00 size, approx. 1.5"-2.5"
10 pieces at $2.00 size, approx. 2.5"-3"
10 pieces at $3.00 size, approx. 3"-3.5"